Make Garden State Your Home Repair Specialists! Whether it's the mercury climbing, dipping, there's no hot water, the drains are clogged, or the oven wont cook your family turkey, you won't need to worry about the added stress. With Garden State, you finally have someone to call! Garden State Air Conditioning has been servicing as well as replacing air conditioning systems, furnaces, water heaters, as well as repairing household appliances for more than 60 years. When it comes to service and installation, Garden State is untouchable. Our technicians are highly trained and certified, and provide expert installation, service, and repair. They arrive on time in company trucks that are stocked with the necessary parts for a quick and thorough repair. 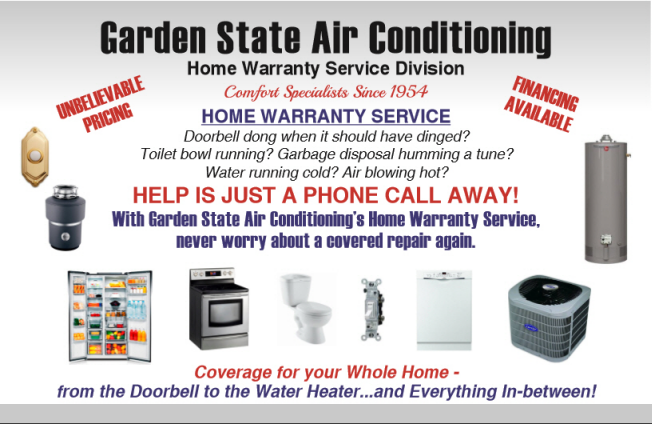 Air conditioner repairs, broken or leaking water heaters, furnaces, attic fans, dish washers, dryers.... all no problem for the experts at Garden State. From start to finish, we'll get your house back in order. And you can always be sure that the work we perform is done correctly for a reasonable and competitive price. The first time, every time. You won't find any hidden charges or fees for service and parts. That's not how we do business. We guarantee it. Whether you need your clothes dryer fixed, or an air cleaner installed, we perform our services with the same level of quality, workmanship, and professionalism that's made Garden State an industry leader in central New Jersey. We stake our reputation on it. So now, you have no more need to worry about a covered repair - contact the professionals at Garden State Air Conditioning. We'll keep your home (and you) safe and happy! Or call Garden State today at 732-462-7800.